The permafrost core doesn’t look like much: a frozen half-cylinder of dirt, four inches across and maybe eight inches long, dark brown and laced with veins of sediment and ice. 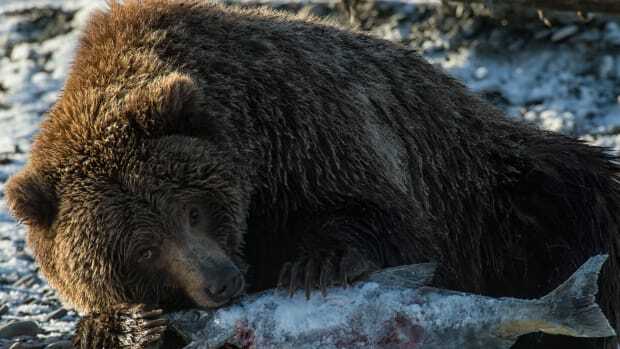 It was drilled out from about six or seven meters below the Earth’s surface, alongside the Alaska Highway, not too far east of the Canadian side of the Alaska-Yukon border. Fabrice Calmels, a research associate at the Yukon Research Center, holds it up above the deep freezer he plucked it from and tells me that it’s been frozen solid for 80,000 years. Permafrost is what it sounds like: ground that is perennially frozen. It occurs in places where the air is cold enough year-round that the Earth never fully thaws. 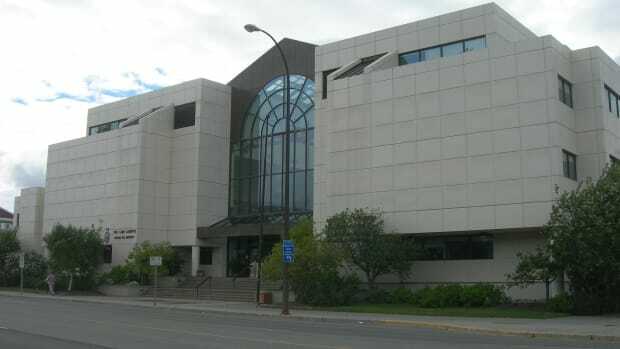 "If the mean annual air temperature is below zero degrees Celsius," Calmels says, "you should have permafrost." 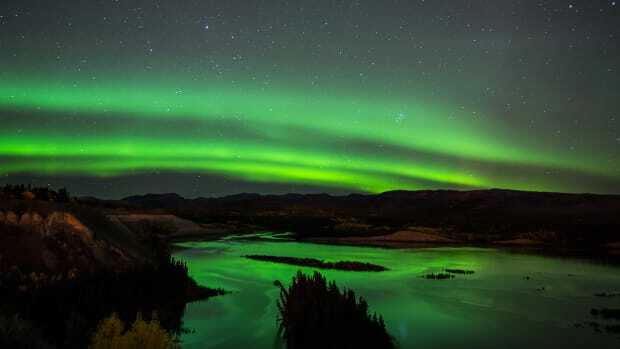 That means it exists in high mountain areas, and across much of the northern latitudes of the planet: Alaska, Canada’s northern territories and the northern portions of some provinces, Russia, and Scandinavia. Calmels and his colleague, Louis Roy, point out the veins of pure ice within the packed soil and sediment of the permafrost core. 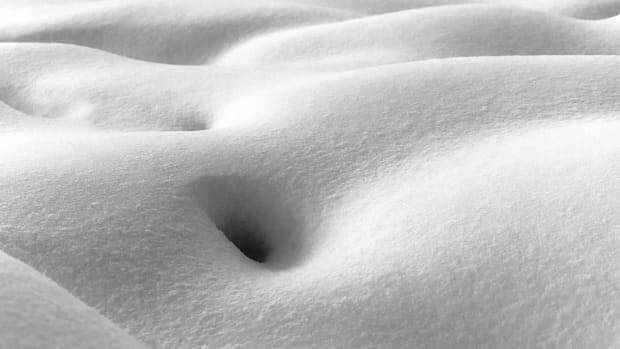 Those are called ice lenses, they explain—and while the individual lenses don’t look like much, when they all vanish at once the loss of mass adds up. "Sometimes," Calmels says, "some core looks like [normal] ground." But if you look closer, it’s actually riddled with microscopic ice lenses. "They are everywhere. So it looks like ground but it is maybe 50, 60 percent ice. Which means that if permafrost is as thick as this room"—he gestures to the high ceiling above us—"you would lose half of it." "If permafrost is as thick as this room"—he gestures to the high ceiling above us—"you would lose half of it." "If you take out the ice, the landscape is changing," Calmels says. "You had the forest, and now you have marsh, the pond." The change affects not just the landscape but also any highways and roads, airport runways, pipelines, and power lines—anything, really, that relies on the ground for its stability. Calmels’ task, then, is to figure out the best way to mitigate the coming damage. To do so, Calmels, Roy, and others have spent the past three summers (this is the project’s fourth year) gathering data about the permafrost alongside the Alaska Highway between the tiny Yukon communities of Burwash Landing and Beaver Creek. They need to know how deep the permafrost reaches in the area, how much of it is made up of ice lenses, and what temperature it is resting at. According to Calmels, "warm" permafrost, frozen at between 0 and -1 degrees Celsius, thaws much more quickly and easily than colder permafrost, which can sit as low as -3 or -3.5 degrees. "Which means that we have some time, maybe, to deal with this problem," Calmels says. "If we have some time to make some remediation strategies, we can maintain the permafrost for a longer time and maybe it will need repairs only every 15, 20 years instead of every five years.... But if we are on permafrost at -0.5 degrees, you know that you are very close to intensive degradation." 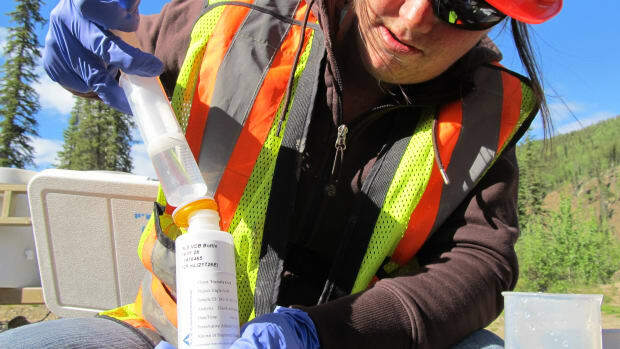 Based on their mapping and surveying, the Yukon Research Center’s team selected a half-dozen potential test sites along the highway, and then drilled for core samples from each to confirm their baseline data. The next phase of the project, which is slated for a pilot launch in 2017, involves working with an engineer from the University of Laval, in Quebec, to design an array of remediation and adaptation strategies that can be put to work in a pilot project along the highway. The idea isn’t to stop the thaw—even without climate change factored in, the mere presence of something like a road can thaw the permafrost beneath it—but to slow its effects. That can mean generating ventilation into the highway’s embankments, to prevent the permafrost below the road from heating up; or creating heat drains, to allow the heat built up below the asphalt to escape through convection. Clear asphalt, which absorbs less energy, is another potential solution. In the Yukon’s classic Gold Rush town, Dawson City, you can see houses built up above ground, designed to be adjusted like table legs or tripod legs as the Earth shifts beneath them. "There’s also the possibility to use a couple of these together," Roy says. "By coupling those two methods, you may actually get better results." "We want to have one kilometer of highway where we perfectly know the condition of the permafrost," Calmels adds, "where we build one or two adaptation methods and we’re able to put in sensors and everything we need." That way, they’ll be able to most accurately assess which methods work best, and to what extent they work at all. "So that’s why it’s important this summer to go and collect cores in the actual ground," Roy says. "What were the conditions before? And then we will know the impact after." The idea of building infrastructure that’s adapted to permafrost isn’t new: The science, particularly for buildings, Calmel says, is "relatively well-known." ("The fact that it is not always well applied is another problem," he adds, laughing.) 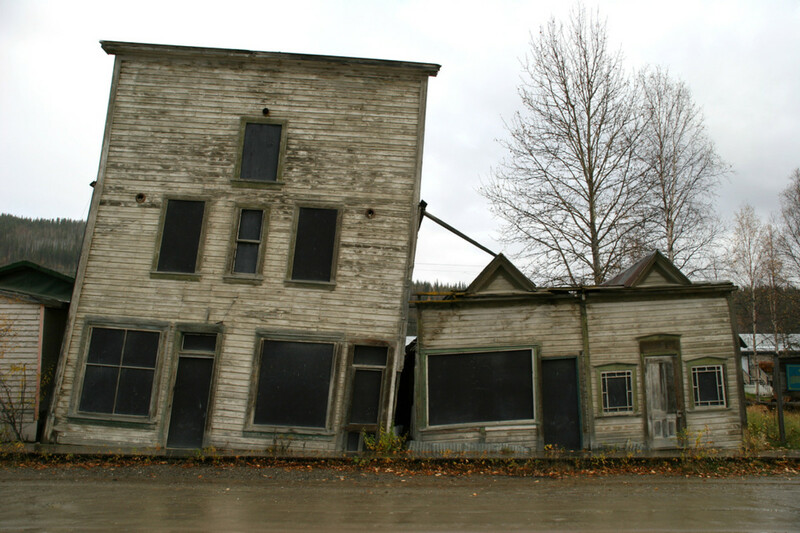 In the Yukon’s classic Gold Rush town, Dawson City, you can see houses built up above ground, designed to be adjusted like table legs or tripod legs as the Earth shifts beneath them. 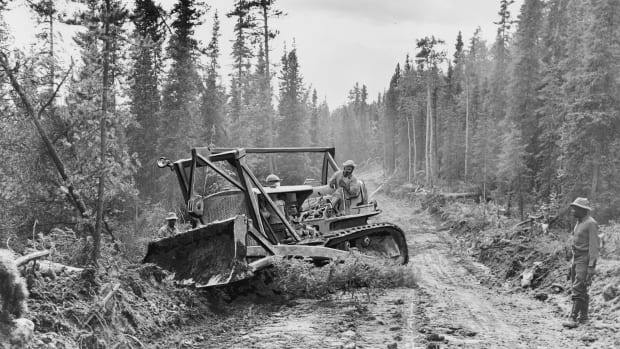 And the territory’s Dempster Highway, built later than the Alaska Highway, was designed with permafrost protection in mind. But the thaw is accelerating, and that means we need more, and better, solutions. "During this 700,000 years, there was a lot of variation. There were even periods warmer than today. There were interglacial ages that were very warm—yet it survived. So it proves that permafrost can be relatively resilient," Calmel says. Permafrost could still outlast this warming, too, or at least go down fighting. It just needs some help to stave off the heat. *UPDATE — July 2, 2015: This article has been updated to more accurately reflect how far the permafrost dates back.